The subject of faith healing can be one that causes many to argue. In fact, it has become a very controversial subject mostly among believers. I have been thinking about this and I would like to offer you what I have found in the Bible about the topic of faith healing. Look up the Scriptures and study it out. You may find a blessing and even some new understanding. Our churches and even our media are/is filled with faith healing ministries. Popular? True, but how many of these programs and ministries promote a true biblical presentation of healing? Or, is this something that believers should be promoting at all, and if so, why? I ask this because when I study it out, I find that true healing, according to how it was done in biblical times, is not something that we see today. In fact, are there people today that even have the “gift of healing”? Let’s look to the Bible for some answers. How Often Were People Healed? From this verse in Matthew 9 we see that Jesus was a healer. According to this verse He healed EVERY sickness and EVERY disease. I say that because 100% of the time that Jesus attempted to heal, healing happened. I do not see any mention of faith here. So there were many (divers) diseases that the people brought to Jesus. Of those mentioned in this passage here in Luke, how many of them were healed? Every one of them! Interesting, I do not see faith mentioned here either. In this passage of Acts we learn that it was not only Jesus who had the gift of healing, it was also His Apostles that had the gift. Not only that, we see that believers were added because of the gift. This multitude that was brought to the apostles were also healed. How many? Every one. Why Did Jesus and the Apostles Heal? Throughout the Bible we see that the sign gift of healing was used to convince unbelievers that Jesus was the Christ, the Messiah, the giver of eternal life, as promised in the Old Testament (John 20:30-31). This power to heal was used even after Jesus rose from the dead to convince and convict the nation of Israel that the promised Deliverer had arrived (1 Corinthians 1:22-24). In fact, every time that we see the use of the gift of healing we see that Jews were present. It was for that specific time and purpose that the sign gifts were given. The most amazing thing to me is that even though Jesus and the Apostles performed these miracles the Jews still did not believe, and because of this grace was given to the Gentiles (Romans 11). In this the Jews were blinded and all except for a remnant of the Jews will remain blinded (Luke 21:24; Romans 11:25; 2 Corinthians 4:4; Revelation 11:2). Gift of Healing for Today? I believe, according to these examples from the Bible that the sign gift of healing like Jesus and the Apostles in the Bible used is no longer given to anyone today. I believe this because if it were true that this gift still exists we would see 100% success when faith healers healed, every time and for everyone. People who study the Bible should agree that the Bible is a logical book. So if you think about it logically, if that sign gift of healing were still in effect today, why would we need doctors or nurses or hospitals or resuscitation equipment or medications or portable oxygen or other life sustaining efforts? I hope that you were using your Bible when you read this article and that you looked up the Scriptures that I provided. I hope even more that you found additional proof that this gift of healing is not for today because if it were those who call themselves faith healers should not be wasting any time, they ought to get busy shutting down every health care facility in our city, county, state, province, country and the entire world. 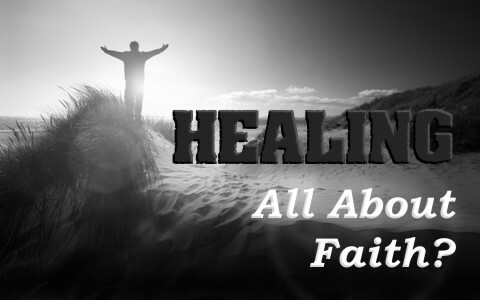 Is healing all about faith? I believe healing is about the Healer and when we look to faith as a “power” for healing we take the glory from God. Well, why did Jesus said this: John 14:12? “Most assuredly I tell you, he who believes in me, the works that I do, he will do also; and greater works than these will he do; because I am going to my Father.” He used words:”he who believes in me” Jesus didn’t say to disciples – if you will believe in me but he who believes. Believe means have a faith then it is about faith. Hello Bernadeta. If we search for the exact phrase in John 14:12a, “the works that I do,” it occurs in one other place in John, namely John 10:25, “Jesus answered them, ‘I told you, and you do not believe. The works that I do in my Father’s name bear witness about me.” So again the function of the “works” in John 10:25 is exactly the same as here in John 14:11–12. My works are the things I do that bear witness about me. So at least we can say with confidence that in John 14:12a Jesus means that all believers will be marked by this: they will be so united to Jesus that they will carry on his work by his power and do the kinds of things that will “bear witness” about Jesus. They will point people to Jesus, and through Jesus to the Father. In his prayer in John 17 Jesus prayed, “[Father,] I glorified you on earth, having accomplished the work that you gave me to do.” His work was what he did to draw attention to the glory of his Father. In John 13:35 Jesus said, “By this all people will know that you are my disciples, if you have love for one another.” A life of love will draw attention to the truth of Christ and the reality of our own new life in him. And in Matthew 5:16 Jesus said, “Let your light shine before others, so that they may see your good works and give glory to your Father who is in heaven.” Christians are defined by works or life which flow from faith in Jesus and point to the glory of Jesus. If you think “greater works” means “more miraculous” you will be hard put to exceed walking on water, feeding five thousand with five loaves and two fish, and raising the dead. I don’t know of any Christian who has ever lived — inside or outside the New Testament — who has ever done all three of those miracles, let alone something more miraculous. Let alone every Christian having done these miracles or something more miraculous so context is important and not just claiming one half of a verse as you have done and making that a doctrine. Thank you Pastor Jack for your commentary. I believe you have captured the true meaning of John 14:11–12; I could not have said it better. All glory to God for your carefully stated response to Bernadeta. Thank you Pam. Yes…all glory to God and none to us (1 Cor 4:7). Next post: How Does God Use Society To Restrain Evil?